Waipi'o Valley is one of those enchanted destinations that people usually only dream of. It is secluded, hard to reach, and stunningly beautiful. It is located at the end of the road just after Honoka'a town in the Hamakua district on the Big Island of Hawaii. Waipi'o Valley is also called the valley of the kings because, as it was explained to us on the tour, many kings were brought to the valley when they were children for protection. Including the Great King Kamehameha. The valley sits at sea level with 2000 foot sheer walls surrounding it, offering great protection. The valley alone is impressive enough but when you catch a glimpse of the 1200 foot majestic Hi'ilawe falls you are reminded of the strong mana (or power) that is in Waipi'o Valley. The Waipi'o Valley Ride the Rim tour starts out just before the Waipi'o valley lookout where you can park, sign all the waivers and them hop in a 4 x 4 vehicle to reach the area where the ATVs are kept. It is all private land so this is an area you can only access on the tour and believe me it is well worth the time and money. I have to admit that I was slightly nervous at the start. Not sure why but since having kids I've gotten more and more timid about weird things. I was worried I wouldn't be able to drive it, worried I would hit someone else, worried it wouldn't make it up the hill, and that I might hit someone else. Funny thing is after the trip it is completely laughable to even consider being worried. The tour was very safe, totally beautiful, educational, and one of our favorite days spent on this island so far! Once you get to the ATVs there is a briefing about how to operate the ATV as well as all safety components. Afterwards there is a small track set up so everyone can get used to how it feels and so that the guides have a chance to see how you ride. This gives you a few minutes to put aside any concerns or to decide you would rather be a passenger and it gives the guides a chance to pull you from the lineup if they do not feel you can be safe enough. There was a very strong feeling of safety after spending just a few minutes with the guides. You can either drive your own ATV (no passengers allowed), ride in a side by side buggy which is basically a 2 person buggy/ATV, or ride with the guide in one of the Polaris buggies. My oldest son and I drove our own while my 12 year old rode in the buggy as you need to be at least 16 to drive the ATV. There is also a weight range of 100-350 pounds to drive your own ATV. They provide helmets for you. There is no actual dress code but closed toed shoes and clothes you don't mind getting wet or dirty is recommended. We wore just our slippers and it was fine but I can see how closed toed shoes would probably be better. I was so thankful for the test track as it really helped to build my confidence and the guides were all really supportive in easing my mind and assuring me that everything was safe. We drove up hills, down hills, through huge puddles, and stunning forests. You cannot really take photos while riding but they provide a safe area to strap a bag onto in the front of the ATV. I had a dry bag and found that very helpful because it will get wet and muddy. We stopped at various view points where the guides used a "talking story" method of educating us about the area including local plants, history, culture, geography, and more. We also had a chance to stop at a beautiful waterfall where they have a platform set up and you have some snacks and drinks but the best part was being able to jump right in, cool down, and float under a beautiful waterfall. It is cold but it was incredibly refreshing. It is known as one of the Kings baths so to think we were swimming in a spot where royalty once did was inspiring. At the last look out we could see the 1200 foot tall Hi'ilawe falls and the guide that spent his entire life living in the valley was able to explain the culture and customs of the valley. I found it especially helpful that we could see the whole valley from that spot making it a lot easier to relate to. The kids and I had an amazing time. I immediately knew we needed ATVs in our lives soon because that was incredibly fun but more than that, it gave me a great respect for the culture and history of the valley as well as Hawaii in general. 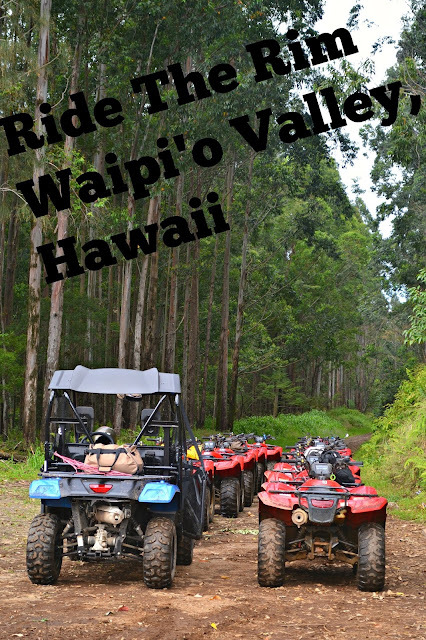 If you have a chance while on the big island get over to Waipi'o valley's ride the rim tour! It's an adventure you will remember forever.